So, how many of you are ready to argue?! Quite frankly, regardless of the information I share today, if you’re a Mac person, you’re probably gonna stay Mac. If you’re a PC person well, I suspect Bill Gates is gonna get some of your money. If you’re a Linux user, well, none of the major NLEs work on you, and you’re normally relegated to high-end finishing applications, like those from Autodesk or for power Resolve users…in which case, this episode probably isn’t for you. Ahh, that new Mac Pro smell. Your decision on your platform is most likely rooted in personal user preference or system simplicity, over more black and white factors, like cost. And that’s OK. If you create all day, you should be comfortable and enjoy the environment you work in. I’ve got nothing but love for each and every platform – as long as you know what you’re dealing with. If you’re going Apple, I think you know you’re going to be restricted on your internal options, including processors and GPUs, and you’ll also be paying a premium for that Apple branding. But you do get somewhat turnkey options, which can simplify the buying process. If you’re PC, you’ll have a ton of more options at a lower price point, but often you’ll have to contend with multiple manufacturers to build your system, and for support if something goes wrong. You’ll also lose out on some software packages, like FCPX, and the ability to easily make ProRes. The heart of any system is the processing power the system has. You can throw a ton of RAM and a high-powered graphics card into a system, but without a decent CPU- central Processing Unit – the system won’t accomplish much. See, a vast majority of software solutions – editing or otherwise – will use CPU power first and only use the graphics card if they can. So, we need to choose our processor carefully. Intel is the usually the first option we look into to – they have a ton of various processors. But the 2 families you’re gonna want to look into are the Intel Xeon and the Intel Core i5 and i7 processors. Of the many differences, I’ve got a few to look out for. Xeons have additional batches of memory that are used to speed up certain applications. Often, and with new systems, this memory is referred to as L3 or Level 3 cache. This additional memory is much more than what an i5 or i7 processor may have, which helps the Xeons to perform better in higher demanding workstations. Xeon chips also support ECC RAM – Error Checking and Correction RAM… we’ll get more into RAM later. ECC RAM can help prevent crashes and data corruption. 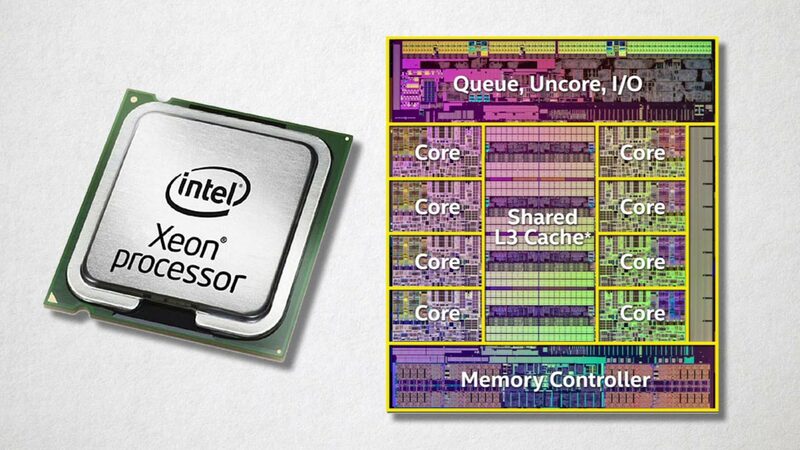 Xeons also support more cores and multiple CPUs. This means you can build a monster processing system with more engines compared to other processors. When we start to examine i5’s and i7’s, things can get hairy. A basic rule of thumb is that an i7 will outperform an i5 in a majority of situations. Why? i7’s also have a larger amount of the aforementioned cache than an i5, which will make repetitive tasks a bit quicker. 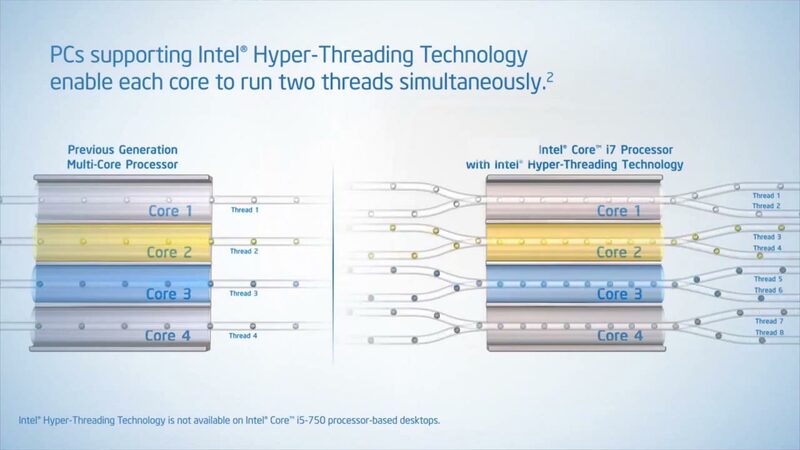 We also have hyperthreading: that is, the ability for the processor to appear to the OS and applications as if are twice as many cores as there actually are. I7’s can scale out further via hyperthreading than the i5, so you can build a beefier system without as many limits. For those of you who like to tweak your systems, i5s and i7’s support overclocking, so if you want to squeeze more power and performance out of your system, you can do it without paying as much. I5’s and i7’s also have onboard graphics ability – which means they can act as your GPU as well. However, the performance as great as a standalone GPU, and we normally add on a GPU for more performance. As far as price, Core i5 and i7’s are usually cheaper than Xeons, too. If we translate all of this data to the major manufacturers of video editing qualified computers, such as Dell, HP, and Apple, a vast majority of the workstation options have Xeon processors. This includes the higher end models of the HP Z Series, the Dell 7000 Series, as well as the canister Mac Pros. If we move to systems that are more multipurpose, or more portable, and that are a bit easier on the wallet, then we get into the Core i5 and i7 processors. You’ll find these on Apple laptops and iMacs, and the more midrange HP Z series and Dell systems. If I was building a system, I’d go with Xeon processors, followed by i7’s and lastly, i5’s. To *over*simplify things, GPU is a fancy term for Graphics card. Over the years, many editing systems have learned to take advantage of graphics cards in addition to the CPU. Why? Well, GPUs offer dedicated processing power separate from the CPU, which is already being used by everything else on the system. GPUs also have the ability to process certain things faster than a CPU – so why not use them? The 2 major GPU players on the market are nVidia and AMD. Each of them has cards with a ton of horsepower, but the cards are only as effective as the language they speak, and if the application you’re working with can speak that same language. nVidia is a proponent of CUDA, which is nVidias proprietary framework. Their cards fly when the host application can use CUDA to communicate with them. And while nVidia cards do understand the open-source OpenCL as well as CUDA, the performance between the two isn’t on par with one another with nVidia cards. AMD cards, on the other hand, rely on OpenCL. As mentioned, OpenCL is open source, and thus, more widely adopted. If you’ve got a Mac – you’re stuck with what you’ve got in the box. New Mac models, including Laptops, MacPros, and iMacs, have AMD cards in them, or, the onboard graphics ability that comes with i5 and i7 chips. With PCs, HP and Dell both have options for AMD or nVidia based cards. 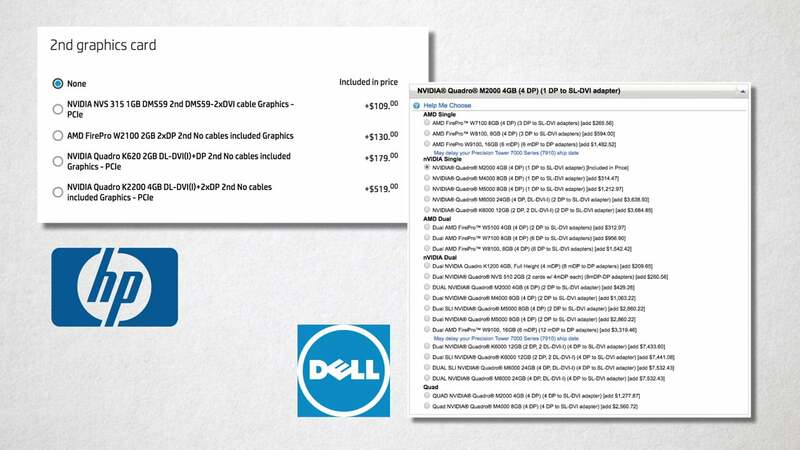 Have it your way: GPU options with HP and Dell. If I were building a system, I’d focus on what applications support GPU acceleration, and then factor that into my decision. For example, Adobe products are faster on nVidia based systems via CUDA than via OpenCL. FCP X is coded to use OpenCL, and since most Apple systems have AMD cards in them, it’s easy to see why. Avid has tended to rely on CPU over GPU, however, Media Composer does use OpenCL on both nVidia and AMD cards. I’d also look into GPUs that have at least 3- 4GB of onboard RAM. This may be tough on some laptop systems, but more and more applications are taking advantage of GPU, and you don’t want to be obsolete too soon. Speaking of RAM, Your system will need RAM, too – not just your graphics card. Your motherboard and processor will dictate what kind of RAM you get, and they’ll also dictate the layout of the RAM – meaning, what slots the RAM goes in, do they have to be run in matched pairs, etc. It is imperative that you match your RAM speeds, amounts, and manufactures if possible. Mismatching can cause system instability or even cause it not to boot properly. Most editing systems want a minimum of 8GB, however, I think it would be a bad idea to get a system with anything less than 16GB minimum, and more like 32GB or 64 more if you can afford it. The basic rule of thumb is to keep your applications on your startup drive, and your media elsewhere. Not only does this protect you – if your boot drive fails, you don’t lose your media, but it also keeps the boot drive working with your OS and applications for best performance – without having to also serve up media. Because of this, we can go with a smaller size boot volume. Nowadays, most systems have SSD options – solid state disks. No moving parts mean more reliability and faster performance. This does come at a cost per GB hit, however. SSDs can cost 5-10x as much as the same size spinning disk. But as I mentioned earlier, we want performance over capacity on your boot volume. Thus, go with an SSD over a spinning disk. I know, not all of you can have multiple drives, and thus you’re willing to compromise. OK, I gotcha. In that case, you want a hard drive that spins at a minimum of 7200 RPMs. Many desktop or bargain bin drives spin several thousands of RPMs lower, which will make video playback painful. Many of the drives also tend to spin down when not in use to conserve power. This is also very bad for video-centric applications. 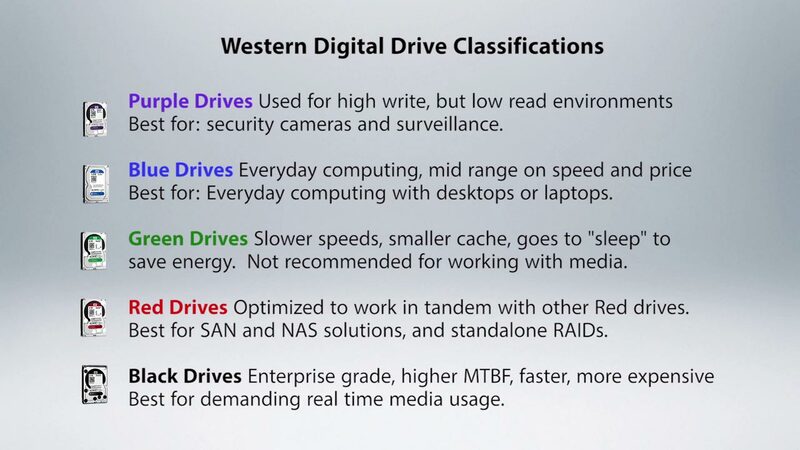 Western Digital, for example, tends to classify spinning drives by color: green, red, purple, blue, and black. You can check out more on choosing the right drives here. In a nutshell, try and always go with enterprise drives, or as Western Digital calls them “black” drives. They last longer, spin faster and deal with higher temperatures better. Cheat sheet on drive colors and abilities. When we look at Apple based internal storage, again, we’re somewhat handicapped. MacPros use flash-based memory – which is like a souped-up USB memory stick directly on the computer. They may also have Fusion drives, which is a hybrid between spinning disk and solid state. Both of these solutions are better than spinning disk, and I recommend them…as if Apple gave you much of a choice. For those of you looking to really amp up your system, you can look into PCIe based storage, either SDD (Solid State Drive) or Flash-based. These systems run even faster than traditional SSDs. However, not all systems support it, so it’s important to check your computer specs to see if the system will even boot from it. They’re also more expensive. More often than not, an SSD as your boot volume is a great balance of cost and size. Now, many of you will want to have additional internal storage – a RAID. And this is great, you don’t have to worry about external cables and ports, and everything is in the box. This is used commonly as a work volume or scratch volume inside your system. However, when we look at PCs, most systems only support software RAID 1 or RAID 0. While RAID1 gives you a 1:1 copy of your media in the event a drive dies, RAID 0 gives you all the speed and none of the protection. These RAIDs are also done at the software level, which means your OS has to handle the media writing to and from the RAID, which is why an Internal RAID isn’t always the fastest. Often, getting a PCIe RAID card to handle all things RAID is a good way to go – it takes the added strain off of the OS and may also introduce additional RAID formats, like RAID5 and RAID 6. 5. What Would You Choose? I get this quite often. Let’s see what you think. I’d go Mac. Yes, it costs more than a comparable PC, and it’s a closed ecosystem with little internal expandability. However, all major NLEs and complementary applications run on Mac OS, including FCP X. You also don’t have to deal with the ever present ProRes issues – that is, ProRes can’t be created natively on PCs without expensive software or unsupported workarounds. Also, although I am a tech at heart, a guy’s gotta sleep, and buying a turnkey system just makes my life easier. Lastly, if I need to contract anyone to create on my system, chances are users out here in Holly-weird will be familiar with it. To be more specific, I’d go with an iMac for my type of work. 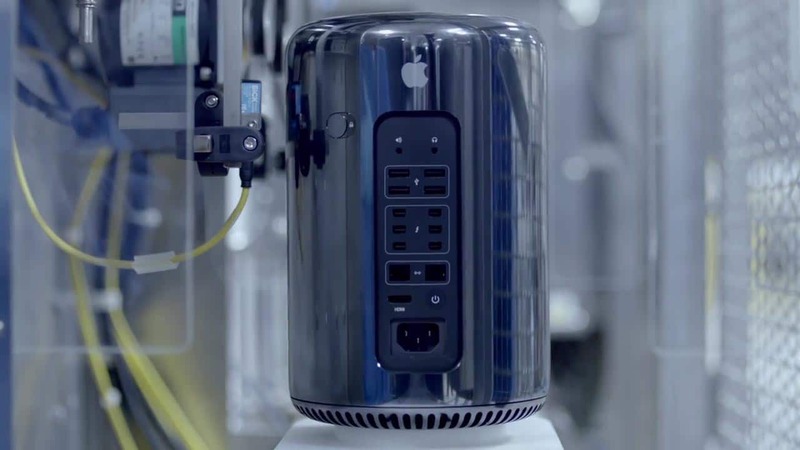 While nice, I don’t need the extreme processing a souped up $9000 Mac Pro has. I’d also choose an iMac that the major NLEs qualify – that includes the GPU. If PC, I’d go with an 8 or 12 core Xeon based machine, with a recent processor. I’d stick in 64GB of RAM, and an nVidia GPU with at least 6GB of onboard VRAM if not more. I’d also put in an SSD boot drive. Of course, if money were no object, I’ll bump all of these specs up. Have more concerns other than just these 5 questions? Ask me in the Comments section. Also, please subscribe and share this tech goodness with the rest of your techie friends….especially at parties. The post 5 THINGS: on Choosing The Right Editing System appeared first on 5 THINGS - Simplifying Film, TV, and Media Technology.